Well my little man turns 7 on tomorrow, hard to believe!! He has already had two celebrations with family and friends so the actual day of his birthday will pretty simple but filled with our special birthday traditions. I wanted to share those traditions with you today. Our first family tradition is to donate a toy for every trip you have made around the sun. Since Zach has been around 7 times, he had to donate 7 toys. We do this at both birthdays and Christmas and each year I am so impressed with his generosity. He gave away more than 7 and smiled doing it. Our next tradition started when Z was a newborn in the hospital. My sister bought him this cute stuffed duck and so we took his picture with it. 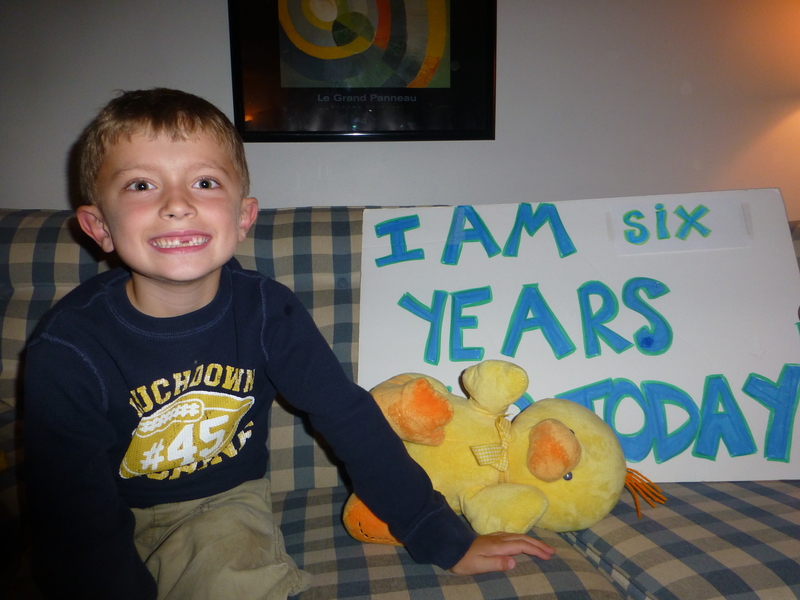 We then took a picture each month for the first year with the duck and now do it on his birthday. It is a fun tradition and I treasure those photos! Our third tradition is to measure the kids on their growth chart. They love to look back and see how much they have grown over the past year and then check out how small they use to be! 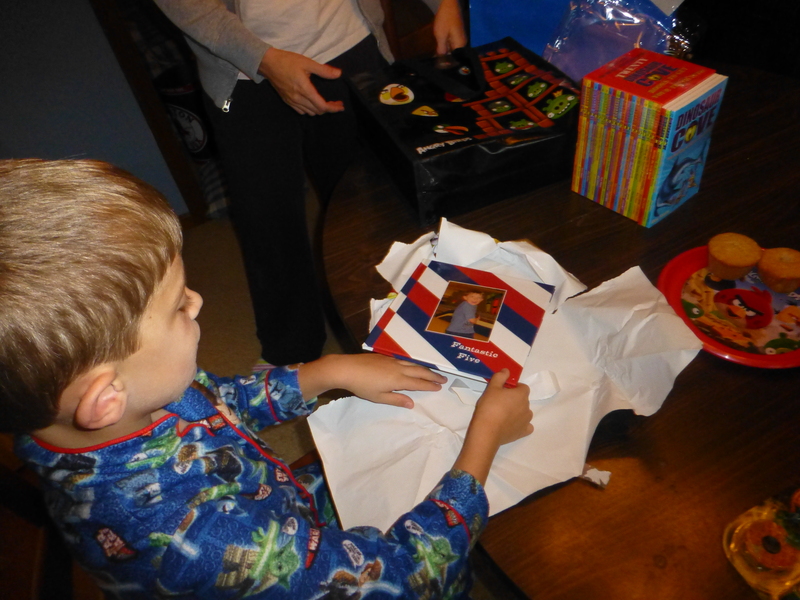 Each year on their birthdays, I give them a Shutterfly book that contains photos from the past year. This year Z’s book is entitled “Super Six” and I can’t wait to give it to him. Believe it or not this is one of their favorite presents and they often bring out the past books to look through them. It is my favorite tradition of all! A few years ago I instituted the four birthday gift tradition. Each birthday they get something they WANT, something they NEED, something to WEAR and something to READ. This keeps things simple and they know that they have to be super careful when deciding what it is that they want. This year Z’s request is a LEGO and he will also receive a pair of rain pants (need), some PJs (wear) and a Star Wars book he has had his eye on (read). With Scott’s crazy work schedule, we always celebrate birthdays in the morning before he leaves for work. This means CAKE FOR BREAKFAST!!!!! 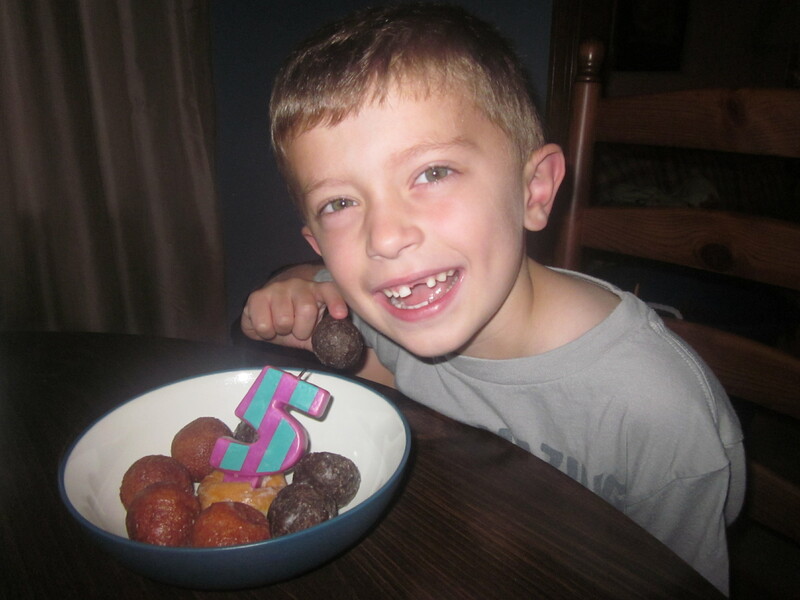 Z does not really love cake so I am thinking a cake made of donuts will be just the thing for his birthday breakfast. Those are our traditions, do you have any special things that you do? ?